The Big Lie! - Exposed! Part II of Darwin's doctrine of delusion exposed! In the New Testament it says, "The first man adam was made a living soul." (1Cor.15:45) Adam was the first man! Not the end of a long series of the process of evolution, but the first man! There were no ape men, there were no men before Adam, he was the first. And it says Adam was made--he didn't grow, he did not evolute, but he was made, and he was made a living soul! "So God created man in His own image, in the image of God created He him; male and female created He them." (Gen. 1:27) Just in case you don't get it the first time around, God repeats it. It says "God created man in His own image, in the image of God created He him." He didn't look like some ape man or monkey, or some fish or bird, He created him like Himself, God. He made man like Himself, in many ways, as an illustration of Himself. So the fully-formed body of Adam lay stretched out there before God breathed into it the breath of life. And until that moment he was just a dead body, stone cold dead, not a spark of life in him! Then God breathed into his nostrils, already fully formed, but dead, not yet alive, NOT DEVELOPED FROM A LITTLE BIT OF JELLY, BUT A FULLY-FORMED, FULLY-GROWN MAN, lying there on the ground made out of dust, mud! God breathed into his nostrils the breath of life, and man, at last, became a living soul! Hallelujah! NOW WE'RE NOT TALKING ABOUT TRUE SCIENCE, the science of true geology, which is not guesswork but actual facts, what they really know about the rocks and what they really know about the earth. That is the literal true science of geology. We're talking about the guesswork of palaeontology, the geologists that went out on the limb and started guessing how it got here, and how long the rocks have been there, and so on, which is all pure fabrication and guesswork! If palaeontology says the world is six billion years old, and the Bible says the world is only six thousand years old, which are you going to believe? The average church-going Systemite thinks, why science, of course! It doesn't even occur to them to doubt science, the sacred cow of science. "Oh my, it must be that the Bible is wrong." SO EVEN MOST SO-CALLED CHRISTIANS TODAY HAVE TRIED TO COMPROMISE WITH SCIENCE-FALSELY-SO-CALLED--and instead of bringing their faith up to the level of the Bible, they try to drag God's Word down to the damnable level of man's foolish wisdom and vain theories. No longer does a Christian need to believe that the Bible means exactly what it says; it ain't necessarily so. When it says "six days" it doesn't really mean that. When it says "In the beginning God created the Heavens and the Earth and the Earth was without form and void and darkness was upon the face of the deep," it doesn't really mean that! It wasn't in those six days; it was billions of years ago. AND NOW WE FIND MORE "CHRISTIANS" WHO BELIEVE IN EVOLUTION THAN THOSE WHO DON'T! More Christians who believe in the so-called "gap theory" and the lies of the geologic ages of the world than don't! More Christians who believe the world is billions and billions of years old than don't! They believe the lies of false geology, believe the lies of evolution, more than those who believe the truth of God's Word! So even the Church is getting sucked in! We have finally reached those days of delusion so strong that Jesus predicted, that if it were possible, even the very elect might be deceived! (Mat.24:24) God help us! Gen.5:1,2 -- The Creation of Adam		6 days	 4160 B.C. Gen.5:3  -- Creation of Adam to birth of Seth 	 130 yrs. 130 yrs. 4030 B.C. Gen.5:6  -- Birth of Seth to birth of Enos	105 yrs. 235 yrs. 3925 B.C. Gen.5:9  -- Birth of Enos to birth of Cainan 90 yrs. 325 yrs. 3835 B.C. Gen.5:12  -- Birth of Cainan to birth of Mahalaleel	70 yrs. 395 yrs. 3765 B.C. Gen.5:15  -- Birth of Mahalaleel to birth of Jared	65 yrs. 460 yrs. 3700 B.C. Gen.5:18  -- Birth of Jared to birth of Enoch	162 yrs. 622 yrs. 3538 B.C. Gen.5:21  -- Birth of Enoch to birth of Methuselah	65 yrs. 687 yrs. 3473 B.C. Gen.5:25  -- Birth of Methuselah to birth of Lamech	187 yrs. 874 yrs. 3286 B.C. Gen.5:28,29  -- Birth of Lamech to birth of Noah	182 yrs. 1056 yrs. 3104 B.C. Gen.7:6  -- Birth of Noah to the Flood		600 yrs. 1656 yrs. 2504 B.C. Gen.11:10  -- The Flood to the birth of Arphaxad	 2 yrs. 1658 yrs. 2502 B.C. Gen.11:12  -- Birth of Arphaxad to birth of Salah	35 yrs. 1693 yrs. 2467 B.C. Gen.11:14  -- Birth of Salah to birth of Eber	.30 yrs. 1723 yrs. 2437 B.C. Gen.11:16  -- Birth of Eber to birth of Peleg	34 yrs. 1757 yrs. 2403 B.C. Gen.11:18  -- Birth of Peleg to birth of Reu	30 yrs. 1787 yrs. 2372 B.C. Gen.11:20  -- Birth of Reu to birth of Serug	32 yrs. 1819 yrs. 2341 B.C. Gen.11:22  -- Birth of Serug to birth of Nahor	30 yrs. 1849 yrs. 2311 B.C. Gen.11:24  -- Birth of Nahor to birth of Terah	29 yrs. 1878 yrs. 2282 B.C. Gen.11:26  -- Birth of Terah to birth of Abram	70 yrs. 1948 yrs. 2212 B.C. Gen.21:5  -- Birth of Abraham to birth of Isaac	100 yrs. 2048 yrs. 2112 B.C. Gen.25:26  -- Birth of Isaac to birth of Jacob	60 yrs. 2108 yrs. 2052 B.C. Gen.47:5-12  -- Birth of Jacob to entering Egypt	130 yrs. 2238 yrs. 1922 B.C. Ex.12:40, 41  -- Entering Egypt to Exodus		430 yrs. 2668 yrs. 1492 B.C. 1Kg.6:1  -- Exodus from Egypt to beginning of construction of Solomon's temple	480 yrs	 148 yrs	1012 B.C. Year 0 to today	1977 yrs. 1977 yrs. 1977 A.D.
TOTAL YEARS from Creation to today 	6137 yrs.--Amen? * All references are from the King James Bible. Well, they say, "COULDN'T THOSE SIX DAYS OF CREATION IN GENESIS CHAPTER ONE HAVE BEEN EONS, AGES?" --I don't know what in the world is the matter with these people! If they believe in God at all, why do they seem to think God had to have so much time to make the world? My God is big enough to create the whole Universe! You think He couldn't have done it in six 24-hour days? He could have done it in six minutes! As Doctor Albert Einstein said in one of his last statements, which is not very widely publicized by our dear "truth" seeking evolutionists (God only knows what their "Ministry of Truth, 1984," has done with it by this time! ), "Now that we know these principles of nuclear fission and fusion, we now realise that THE EARTH AS WE KNOW IT COULD HAVE COME INTO EXISTENCE IN A MOMENT OF TIME," BOOM! Just like that! YOU'RE EITHER GOING TO HAVE TO BELIEVE IN SIX STRAIGHT 24-HOUR DAYS OF CREATION FROM THE BIBLE, OR YOU BELIEVE THE BIBLE'S A LIE! Because God told the Jews, "Six days shalt thou labour, and do all thy work: But the seventh day is the Sabbath of the Lord thy God: In it thou shalt not do any work. For in six days the Lord made Heaven and Earth, the sea and all that in them is, and rested the seventh day: Wherefore the Lord blessed the Sabbath Day and hallowed it." (Ex.20:9-11) If each of those original "days" were a million years long, as some of these compromisers say, then it means the Jews had to work and do hard labour for six million years in order to enjoy their "seventh day" rest of another million years! Of course, now they're saying creation took six billion years!--So a billion-year Sabbath! YOU HAVE TO INTERPRET SCRIPTURE CONSISTENTLY. You cannot say this means that over here and it means something else over there. If God made the Heaven and the Earth in six days, and God's Word says so, I believe it, and if then He told the Jews to work six days just like He did and rest on the seventh day just like He did, it's obviously a physical impossibility for anybody to work six billion years or six million years or even six thousand. These days here are regular, 24-hour days just like we have today! "THE LORD GOD MADE THE EARTH AND THE HEAVENS, AND EVERY PLANT OF THE FIELD BEFORE IT WAS IN THE EARTH, and every herb of the field BEFORE it grew. ..." Did you get that? He made every plant of the field, when? BEFORE it was in the earth! He made it full-grown and perfect, and then He planted it! How about that? And every herb of the field, what? Every herb of the field BEFORE it grew! When? BEFORE it grew! Evolution says that it just gradually developed and grew. He made everything full-grown, mature, including plants, animals and man! So now you know which came first; the chicken, not the egg! Another interesting point is that all plant life was made on the THIRD day of creation and the sun was created on the FOURTH. (Gen.1:11-19) If these "days" of creation were thousands or millions of years, all vegetation would have perished in darkness-they had to be 24-hour days! BUT WHAT ABOUT THESE RADIOACTIVE DATING METHODS that they use to try to prove the earth and mankind are so many million or billion years old, contrary to the Bible? These methods are based on PURE ASSUMPTION AND THEORY! Take the Carbon-14 method, for example: This means of dating is based on the amount of radioactive carbon found in the remains of once-living organisms. This radioactive carbon, or radio-carbon, is a substance which is formed by the sun's cosmic rays as they enter the earth's atmosphere. It is then absorbed only by living plants and animals. So when the organism dies, the C-14 in its remains begins to slowly decay and is not replaced. Hence the paleontologist tries to measure the amounts of C-14 left in his fossil to determine how old it is. However, "ONE OF THE MAIN ASSUMPTIONS OF C-14 DATING," according to "Science" Magazine, "is that the atmospheric radiocarbon level has held steady over the age-range to which the method applies." But what if the C-14 level has not held steady? What if it has changed? Science Digest answers: "It most certainly would RUIN some of our carefully developed methods of dating things from the past." If the level of carbon-14 was less in the past, due to a greater magnetic shielding from cosmic rays, then our estimates of the time that has elapsed since the life of the organism will be TOO LONG" And this is exactly what has happened! THE LEVEL OF CARBON-14 WAS LESS IN THE PAST! Not only due to a greater magnetic shielding, but also due to a great moisture covering which the Bible calls "the waters which were above the firmament" or atmosphere. (See Gen.1:6,7.) This water-blanket veiled the earth protecting it from the powerful cosmic rays! But during the Flood, when God opened up the fountains of the deep, and the Heavens poured down and it rained for forty days and forty nights, apparently that envelope of moisture that protected us from those harmful cosmic rays was removed. THE FACT THAT THESE "WATERS ABOVE THE FIRMAMENT" DID SHIELD THE EARTH FROM THESE C-14 FORMING COSMIC RAYS IS MADE APPARENT IN THE SCRIPTURES: Immediately after the Flood men's lives were shortened to almost one-tenth of what they were before the Flood! Now science has proven that cosmic rays are what cause aging and finally, along with your sins, bring on death. So when that cloud covering disappeared, those deadly cosmic rays began to really come through. and instead of living eight, nine hundred or a thousand years, all of a sudden they began to live only about 70 to 120! So what does all of this prove? It proves that their big assumption that "the atmospheric radio-carbon level has held steady over the age-range" is a FALSE assumption! It has not held steady, as the present atmospheric conditions didn't even come into existence until after the Flood! So their "carefully developed methods of dating things from the past" ARE "ruined"! And their "estimates of the time that has elapsed since the life of the organism" ARE "too long"! Even "Science Year" has confessed, "Scientists have found that the C-14 concentration in the air and in the sea HAS NOT REMAINED CONSTANT OVER THE YEARS. as originally supposed." Another interesting fact is that THEY HAVE NEVER YET FOUND ANY SUBSTANTIAL ARTIFACTS OVER FIVE OR SIX THOUSAND YEARS OLD. The World Book Encyclopedia confesses this by saying: "The earliest records we have of human history go back only about 5,000 years." This is why they always refer to their theoretical time-periods over five or six thousand years ago as "prehistoric," because there is no historical evidence to prove such a time existed! It's all guesswork and speculation designed to support their big fairy tale of evolution! "IN THE BEGINNING, GOD," NOT CHAOS, NOT SOME NEBULOUS CLOUD OF GASES, BUT "IN THE BEGINNING GOD, CREATED THE HEAVENS AND THE EARTH!" --the first verse of the first chapter of the first book of the right Book, praise God!" In the beginning, God created the Heavens and the Earth." Now either you believe that, either you believe what God's Book says, or you're going to take what some liar says! THIS IS THE PREMISE AND PREFACE AND FOUNDATION OF THE ENTIRE BIBLE! In the beginning, first of all, what? God, there's God! And God did what? He created the Heavens and the Earth! So if you don't believe in either one, then you're off the beam. There's a God, and He created the Heavens and the Earth! And this is the basic foundation: If you don't believe this, you can't believe anything! BECAUSE WHEN YOU DOUBT ONE, ONE WORD IN THE BIBLE, YOU'LL SOON DOUBT THE WHOLE BIBLE! Why? What happens in a court of law with the testimony of a witness, when one thing he's said is proven to be a lie? what do they do with his entire testimony?--They throw the whole thing out, including the true things he said, because they can't believe it and every word will be in doubt. If he lied about one thing, maybe he lied about another? And that's the way it is with the Bible. If you can't believe every word of it, then you can't believe every word of it, then you can't believe any of it! JESUS SAID, "HAD YE BELIEVED MOSES, YE WOULD HAVE BELIEVED ME... But IF YE BELIEVE NOT his writings, how shall ye believe My Words?" (Jn.5:46,47) Now, what's the first of Moses' writings, upon which all five books are based? GENESIS! "In the beginning. ..." all about creation, the history of Israel and the beginning of God's dealings with man. If they had believed that book of Genesis all about creation, God, then they would have accepted Jesus Christ as their Saviour. WHAT, THEN, DID THE DEVIL KNOW HE HAD TO DO TO PREVENT PEOPLE FROM BELIEVING IN CHRIST? He knew he had to destroy their belief in the writings of Moses, in the book of GENESIS in particular, the creation, the glorious creation! He had to destroy their faith in this, and this would prevent them from believing anything else, the Bible, Jesus, or anything else, anything, if he could destroy their faith in creation! And how'd the Devil do that? By what doctrine or what big lie? EVOLUTION!--THAT WAS HIS GREATEST LIE and greatest manufacture and most clever piece of teaching, evolution! As ridiculous and idiotic as anything you could possibly study, because it has NO FOUNDATION IN FACT whatsoever; there's no evidence for it, no discovery yet has been made to prove it! As one of its top exponents, Margaret Mead, the famous contemporary anthropologist wrote in her own introduction to her textbook on anthropology: "We as honest scientists must confess that science has yet to discover one single iota (tiny speck) of concrete evidence to prove the evolutionary theory!" So Why? WHY DID THE DEVIL AND MAN COOK UP THIS RIDICULOUS, IDIOTIC SCHEME OF EVOLUTION? To try to get rid of God! To try get rid of God and the knowledge of God, "as they did not like to retain God in their education." And since they threw God out, and they threw Creation out, and they threw the Bible out, they had to cook up something new! As Prof. L.T. More of the University of Cincinnati confessed, "Our faith in the idea of evolution depends upon our reluctance to accept the antagonistic doctrine of special creation." They didn't want the truth any more, so they had to figure out some big lie! And that's why they cooked up evolution! THE LOGIC OF EVOLUTION IS IF YOU'RE JUST A BEAST THEN LIVE LIKE ONE! If you came out of hell, live like hell, and go back where you came from! After all, if there's no Planner then there's no Plan! If there's no Ruler then there are no rules! If there's no Judge then there's no judgment! If there's no God, then there's no right or wrong! If life is only "the survival of the fittest," then there are no crimes! If in a fit someone kills somebody, why he's the "fittest" and should be allowed to "survive!" After all, it's not the poor brute's fault, he's just an animal, that's just the way he evolved, it's just the savage in him from his ancestors coming out! HITLER OBVIOUSLY WAS A FIRM BELIEVER IN EVOLUTIONARY PHILOSOPHY, and he continually repeated this theme in his speeches. "The whole of nature," he said, "is a continuous struggle between strength and weakness, an eternal victory of the strong over the weak." Doubtless, many repressive regimes have found it only too easy and convenient to attribute their mass murders and political purges to "natural selection's" elimination of the weak in favour of the strong! SO THE BIG LIE, EVOLUTION, THE BIGGEST LIE IN THE WORLD, IS LARGELY RESPONSIBLE FOR MANY OF THE WOES AND THE ILLS THAT THE WORLD IS SUFFERING TODAY, including selfishness of economy, confusion of government, horrible mishandling of crimes, and all the rest of it--one grand, great, awful mess, due to what? Refusal to believe what Moses said--the writings of Moses in Genesis, the book of beginnings! And by refusing Moses' writings they reject Jesus Christ as well! So instead of His loving laws of "As ye would that men should do to you, do ye even so to them" and "Thou shalt love thy neighbour as thyself" (Mt.22:39;7:12), all they've got is the cruel code of dog-eat-dog selfishness! No wonder we have so much crime and so much murder and everything else! Because you're your own judge! THERE'S NO STANDARD EXCEPT YOUR STANDARD, and you can make any standard you want to! We're devolving, that's for sure, devolution instead of evolution! We are going downhill instead of uphill! PEOPLE TODAY DON'T KNOW WHAT TO BELIEVE, THEY DON'T KNOW WHERE THEY'RE FROM, WHO THEY ARE, WHERE THEY'RE GOING. They don't know what to identify themselves with, the 'search for identity'. Who am I? What am I supposed to be? There's no God, no Bible, no rule-book! They doubt everything, they can't believe anything except the philosophy of existentialism: "I exist, therefore I am. All I know is I'm alive." EXISTENTIALISM MEANS THAT ABOUT ALL YOU KNOW IS YOU'RE ALIVE, YOU EXIST'. Now that they're taking LSD, smoking marijuana and everything else and they get into the realm of the spirit, they're not even sure of that! ABSOLUTE CONFUSION! Totally unrelated, no identity!--Why? Because they've lost touch with the only concrete frame of reference, and that is God, and His explanation, the Bible! No book, no standard to go by, nothing! WE CANNOT CONVINCE YOU THAT EVOLUTION IS A LIE! Because if you haven't got enough sense to see that and appreciate the truth of the Bible, if you would rather believe in evolution than the truth of God's Word, then be deluded and deceived, 'cause that's what you will be! He said, "Because they received not the love of the truth, that they might be saved ... for this cause God shall send them strong delusion, that they should believe a lie: That they all might be damned who believed not the truth!" (2Thes.2:10-12) And if you don't like the truth, you've only got one alternative and that's a lie! IF YOU DON'T LIKE THE TRUTH YOU DESERVE TO BE DECEIVED! If you don't want a life-saver, drown! If you haven't got enough sense to recognize the truth when you see it, may God have mercy! And He has had mercy in trying to give it to you. But one of these days, instead of having mercy, He's going to have justice and you're going to get what's coming, and what we all deserve, except for the mercy, of God! I know this sounds like pretty rough language, but I'm just telling you what's going to happen to you if you don't want the truth; sometimes it helps wake people up! Jesus said, "IF THE LIGHT THAT IS IN THEE BE DARKNESS, HOW GREAT IS THAT DARKNESS!" (Mt.6:23) How horrible to think that you're right when you're wrong! How horrible and heinous to think you've got the right kind of belief when it's a fake and a farce and a phoney and nothing even resembling reality! JESUS IS "THE WAY, THE TRUTH, AND THE LIFE!" (Jn.14:6). PRAY AND ASK HIM TO COME INTO YOUR HEART, forgive your sins, and give you a new life, and He will! He promised: "Behold, I stand at the door and knock: If any man hear My Voice and open the door, I will come into him" (Rev.3:20). "And ye shall know the truth, and the truth shall make you free." (Jn.8:32) Free from sin, self, hypocrisy, and the damnable lies which deceive and delude so many--like EVOLUTION! GOD BLESS YOU! WE LOVE YOU! COME AND VISIT US! There are thousands of us in hundreds of Colonies throughout the world, and some of us are sure to be near you somewhere! Or write us today and order some more eye-opening MO Letters from the address below nearest you! P.S. To those of you who know and love the truth and your fellow man: We hope this lesson will encourage you to STAND UP for your convictions and to take the initiative in ATTACKING with vigorous and vocal PROTEST the diabolical lies of the Devil being spouted with such Satanic venom by his high priests of man's vain knowledge in an educational system designed by the Devil to destroy faith and exalt man and make you a devotee of creation rather than its Creator! STAND UP FOR THE TRUTH AND FIGHT FOR YOUR FAITH! Give clear ringing testimony before others that they, too, may know the truth so that the truth may set them free! IF YOU DON'T DO IT, WHO WILL? Don't be a lukewarm compromiser who makes God sick! (Rev.3:15,26) Jesus said, "Whosoever shall be ashamed of Me and of My Words in this adulterous and sinful generation; of him also shall the Son of Man be ashamed, when He cometh in the glory of His Father with the holy angels!" (Mk.8:38) "Whosoever shall confess Me before men, him will I confess also before My Father which is in Heaven." (Mt.10:32) So why leave the field to the forces of evil and evil evolutionists? STAND UP FOR JESUS AND HIS TRUTH TODAY! Hallelujah! Dr. Dino - Dr. Kent Hovind's excellent work exposing the *real* enemy! Y.E.C. 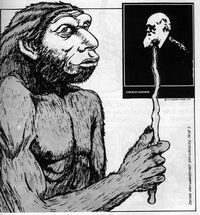 Headquarters - A great article with illustrations showing how Darwin's doctrine of Evolution is inherently linked to racism and was the excuse of Hitler's extermination of so called "inferior races" like the Jews, Blacks, Slavs, etc. Did you know that Evolution and racism are related? I disabled adding additional comments to this page. There are more than enough comments to prove debates have no merit whatsoever. You either choose to believe the truth of creation by Intelligence design, God, the Creator, or you choose to believe the assumptions and theories of pseudo science. You either choose to believe the record of Genesis 1:27 "So God created man in his own image, in the image of God created he him; male and female created he them." or you choose to believe the assumption of pseudo-science, "Life arose from nonliving matter"
I am not against learning and science. True scientific research is supposed to be a quest for knowledge. Knowledge is supposed to better our lives, not hurt them. Darwinism is not science, it is dogmatism, the tendency to lay down principles as incontrovertibly true, without consideration of evidence or the opinions of others. You might call me dogmatic as well. However I have been on the other side of this debate! I once believed that Evolution was true science but choose to reject it after learning the truths of the Bible.